A White House task force on Tuesday issued proposals to tighten the grip on the illegal global seafood trade, which the group said causes billions of dollars in losses to the legal fishing industry annually. 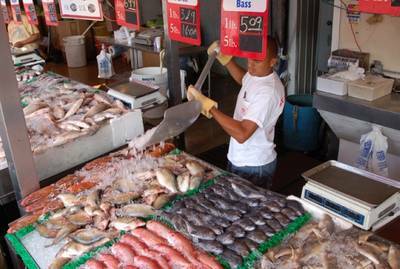 Under the plan, the United States would create a program to trace seafood entering its ports from the source to the shelves, to prevent illegal products from getting into the domestic market. The recommendations would compel Congress to grant several federal agencies the authority to search, inspect and seize illegal seafood at U.S. ports and on sale, and to prosecute offenders as part of the wider effort to combat "pirate fishing." U.S. President Barack Obama formed the task force in June with representatives from 14 federal agencies to tackle illegal, unreported and unregulated fishing, as well as seafood fraud that includes mislabeling, misbranding and falsification of product origins. Federal agencies estimate that illegal seafood trade causes up to $23 billion in annual losses globally and is one of the biggest threats to the world's fisheries and oceans. Up to 90 percent of seafood consumed in the United States is imported, according to the National Oceanic and Atmospheric Association. A study published in the journal Marine Policy in April found that up to 32 percent of wild-caught seafood imported into the United States in 2011 was illegal. "Pirate fishing vessels take in fish without regard to the sustainability of ocean ecosystems," the White House said on a statement on its website on Tuesday. "Not required to file trip plans or carry transponders, the ships roam the oceans in the shadows and become vectors for human, drug, and arms trafficking." The task force recommended that curbing illegal fishing be included in free trade deals and U.S. agreements with other countries to fight illegal trafficking of drugs, weapons and people. Under these recommendations, the U.S. Trade Representative would coax foreign governments to commit to ending subsidies to their fishery sectors by 2020. Such subsidies, the group says, encourage over-fishing and contribute to illegal activity. The task force said the rules would create a level playing field for legitimate fishers and boost consumer confidence in seafood sold in the United States. The public has 30 days to make comments or recommendations before executive action from Obama.